Hannukah occurred a few weeks ago, so I extend to you a belated Happy Hannukah. I have just read two books on my Kindle that are amazing; I highly recommend them! The first is called the THE RABBI WHO FOUND MESSIAH by Carl Gallups - the story of Yitzak Kaduri and his prophecies of the Endtime. Yitzak was an orthodox rabbi who was born in Baghdad and moved to Israel when he was young. He lived to be 108 years old and became one of the most well known rabbis in all of Israel. Throughout his life prominent leaders spoke prophetic words to him with mystical portents of his future. In November 2003, Rabbi Kaduri claimed he met the Messiah in a mystical vision and was told His name. In September 2005, Yitzak said to his followers “I have a word from HaShem. This revelation will also involve the fulfillment of several prophecies - some ancient, some relatively modern...” Rabbi Kaduri penned a note where he wrote the name of the Messiah, but ordered that the note not be opened until one year after his death. During Yom Kippur 2005, Kaduri received a revelation where he mentioned the Messiah would appear to Israel after Ariel Sharon’s death. Sharon was a renowned Israeli diplomat and retired general who served as Israel’s eleventh prime minister. Just a little more than two months after Kaduri’s pronouncement on January 4, 2006, Ariel Sharon suffered a massive stroke and lapsed into a coma. On January 28, 2006, twenty-four days after Sharon’s stroke and coma, Rabbi Kaduri died after a brief bout with pneumonia. An estimated quarter million people attended his funeral. 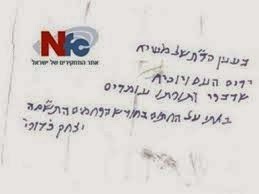 January - April, 2007: Rabbi Kaduri’s final wishes were carried out. A handwritten note, reportedly penned by Kaduri and sealed for the past year was opened. The note was hand written in Hebrew and included this sentence: “He will lift the people and prove that his word and law are valid.” (I’ve included a picture of the note below.) As a mystical Rabbi, Kaduri used a technique in the note whereby the first letter of each word in the sentence spells out a name. The name revealed in this note is YeHoShua, a form of the name Yeshua. When his family, friends, and the nation as a whole learned this, there was confusion, disbelief, amazement, and anger. Like the Apostle Paul, Kaduri had an encounter with the Messiah and was at odds with his fellow Jews. Against this backdrop I then read the Harbinger - the ANCIENT MYSTERY that holds the Secret of America’s Future by Jonathan Cahn, which I found to be equally amazing and relevant, though it was written as a novel. Jonathan, who is a Messianic Jew, compares the text of Isaiah chapter 9 with what has happened to America since 9/11 and the parallels are truly amazing. If you want proof that God is active today and involved with our world, then read this book. It also shows the validity of studying the festivals since the key dates in the events since and including 9/11 have occurred in harmony with some of the events in the Biblical calendar. As you read the book you feel as though this could be the script for the next “National Treasure” movie starring Nicolas Cage and Diane Kruger. If only it were just a movie, for the prophecy in Isaiah 9 foretells of God’s judgement on a defiant and sinful nation. How this carries over from Israel to the United States is the subject of debate, but the numbers and dates are hard to refute.